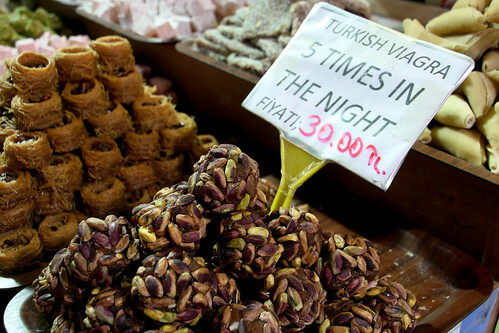 Turkish Delight is not just a dirty euphemism. 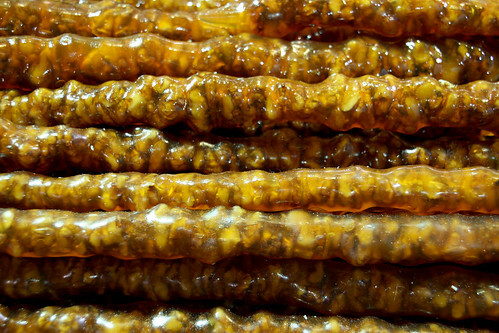 Though it does sometimes come in sausage or tube-like shapes, it’s a rather tasty sweet. 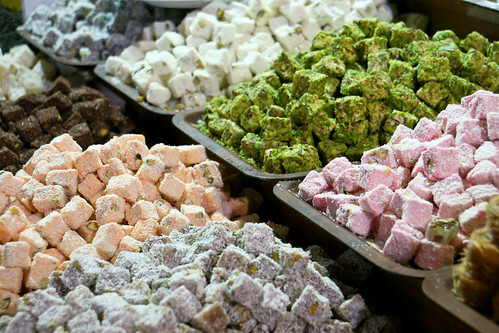 To be accurate, fresh Turkish Delight, or Lokum is tasty, a sort of blend of taffy and marshmallow. Often it is infused with flavors like orange or rose, but our favorites tended towards nuts, coffee, and chocolate. Beware, eating stale and processed Turkish Delight is like trying to chew on your sneaker. 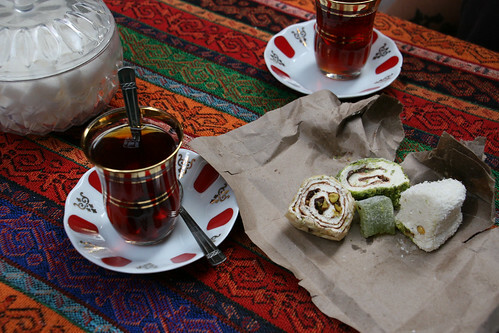 If you come to Turkey, it would be impossible to not find this treat. The locals realized Lokum is one of those “easy sells” so every store in the country flashes it to tourists. We would say its worth trying, but hard to imagine this as the world’s greatest sweet. A rarer sweet is Mesir Macunu which was traditionally made of 41 different spices. Unfortunately, the modern version being sold is lucky to have half that number. Both Lokum and Mesir Macunu were served as digestives after a meal but only Mesir is currently sold as a “natural viagra” by the crafty sellers at the spice market. 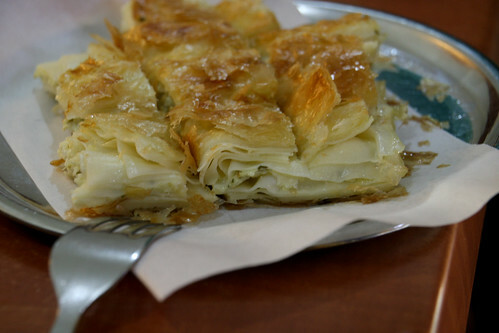 There are the usual sweets found in this part of the world like Baklava in its many gooey, sweet forms, from shredded to flaky pastry There are also tons of cakes and rice or chocolate pudding. 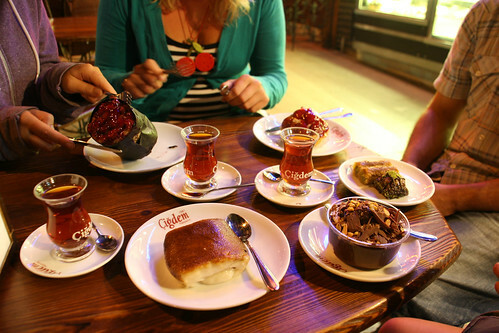 Most of these desserts are sadly similar to anything you have experienced any where else, including your home country. We did find an exciting variety of candied fruit even including such rarities as candied tomato, eggplant and young walnut. 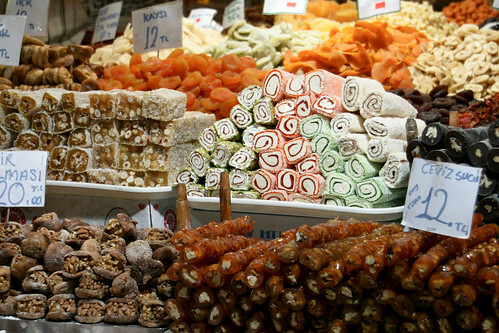 However, there are two experiences you should have in the unique sweets department while in Turkey. 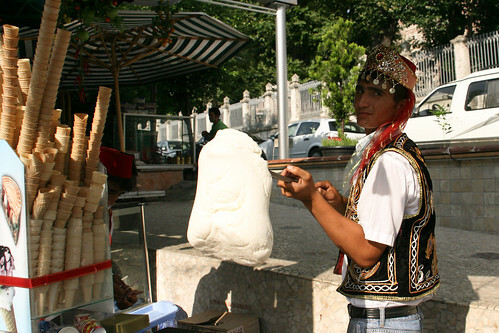 One is Turkish Ice Cream or Marasli Dosme Dondurma. This ice cream usually only comes in a few flavors but its not the taste that makes this unique. It is the texture. 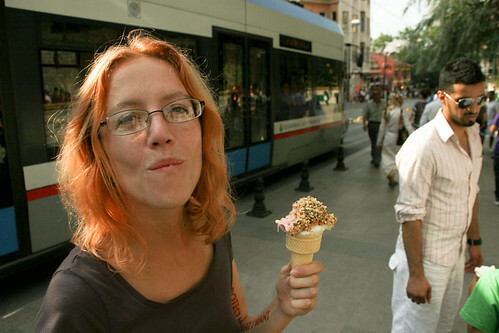 You have to chew this ice cream, like a taffy on a cone. A little weird, you often see the Ice Cream man lift the whole ball of ice cream out of the bucket, with his “sword,” and twirl it around. Buying the ice cream is also a strange game as the ice cream man will serve the ice cream on the end of a long rod with which he will put the poor unsuspecting tourist through a whole gamut of acrobatic ice cream grabbing maneuvers. 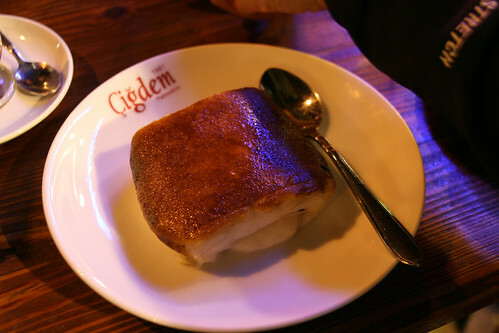 Perhaps even stranger, the second unique experience in Turkish sweets is Tavuk Göğsü, a pudding with shredded chicken breast. We are not kidding, the name literally translates to “chicken breast.” This dessert is like Crème brûlée with a fibrous, chewy texture. Its particularly confusing because, like every other food, it tastes like chicken only sweeter. Just remember, as our friend Cha Cha discovered, you should be clear if you are female and are offered Turkish Delight, what exactly is being offered. This post has made me quite hungry and missing Turkey at the same time. I still don’t like any desert with chicken in it but kunefe (with cheese) is a good combo of sweet with salty. OMG. That may the most delicious looking food post you’ve posted yet. Oh man, this brings back so many awesome (recent) memories! The borek, roasted hazelnut Turkish delight and that fantastic chewy ice cream… I found out the ‘secret’ ingredient is mastic, in case you were wondering! We’re in London now – going to Toulouse next. Will you be in France in Oct? The Bulgarians had us drinking their Mastic, their version of Ouzo. The coolest part is it crystalizes from being to cold. We just aren’t that big on the anise flavor. 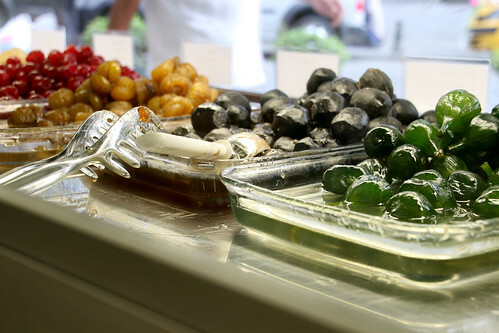 Greece had some kind of Mastic dessert that is supposed to be dipped in water, we think, but it was hard to find? Unfortunately, we aren’t doing France or Italy on this trip. We went through Germany and into the UK instead and we are now in India. Would have been fun to meet up with a fellow traveler, compare notes. May I just say such a comfort to find somebody who definitely knows what they are sharing on the web. You definitely discover how to bring a major issue to light and make it vital. Even more people should study this and understand it all aspect of the story. I can’t believe you are not very popular as you essentially have the gift. Where are Liz and Adrian? All images, content and design © 2008 2009 Eva Rees and Jeremy Rees unless otherwise noted.